Virat Kohli is regarded as the fittest cricketer in the present scenario, as he has comfortably managed his heavy workload of national duties, despite suffering from minor injuries and groins. Virat Kohli has a strict fitness and diet routine, as he prefers a protein-rich sandwich over a burger and invests most of his time in practice and training. “My reason was totally different. It had to do with playing at a certain level in professional sport. I realised in the process that when I started getting fitter, I started thinking better. I had more confidence, clarity, focus and determination. And I started feeling that inside me as soon as I changed my physical regime. That’s when I began to think that everybody should be doing this. Getting fitter makes you confident overall. It makes you feel good about yourself. You need to feel good to have good thoughts. And then came about this idea of pushing people towards fitness to make them understand why this is so important,” he said in an interview, talking about the significance of fitness in his career. Kohli's fitness has been the major reason for his increased focus, extra stamina and improved immunity. Thus, if you are looking for someone to idolize, in order to increase your physical fitness, Virat Kohli is the man for you. 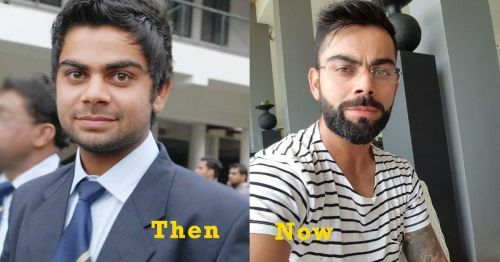 The transformation of Virat Kohli from a chubby young man to a fit and handsome Indian captain has been epic. Should Virat Kohli play at #4 in the 2019 World Cup?